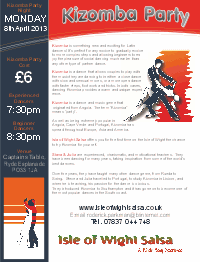 On 8 April we are holding a Kizomba night at the Captains Table from 7:30pm till 11:00pm, this is the first time that Kizomba has been taught on the Isle of Wight. Kizomba is something new and exciting for Latin dancers. It’s perfect for any novice to gradually evolve to more complex steps and allowing beginners to enjoy the pleasure of social dancing much easier than in any other type of partner dance. It is a dance that alows couples to play with the music they are dancing to in either a close dance with slow sensual moves, or a more open dance with faseter steps, foot work and tricks. In both cases Kizomba provides a warm and uniqye experience. Steve & Julia are experienced, charismatic, and motivational teachers. They have been dancing for many years, taking inspiration from some of the world’s best dancers. Over the years, they have taught many other dance genres, from Rueda to Swing. Steve and Julia travelled to Portugal, to study Kizomba in Lisbon, and when he is teaching, his passion for the dance is obvious. They introduced Kizomba to Southampton and it has gone on to become one of the most popular dances in the South coast. £6 on the door. But please try to let us know that you will be coming.